Located on the bay just across the street from Schlitterbahn. Read about in our feature. Providing nightly entertainment and fine dining, Louie's has great views of the Atlantic Ocean from many vantage points. Meals are served daily for lunch and dinner, ranging from steaks, seafood, and specialty dishes. For our evening meal, we chose the all you can eat seafood buffet, as the selections are numerous and freshly made. 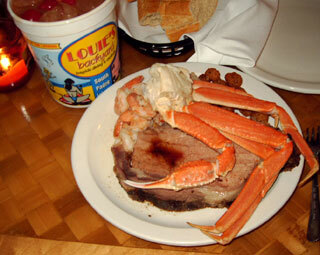 We found all the buffet selections to be fresh and delicious, and especially enjoyed the snow crab legs. David our waiter, was on top of his game, giving exceptional service and advice on places to see around the island. 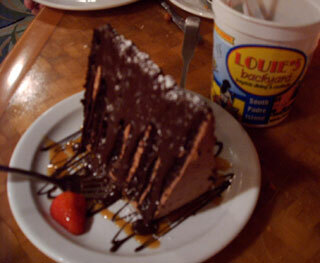 The "Death by Chocolate" desert is a six layer of triple chocolate high rise cake, with carmel and strawberry. It was almost too much for the both of us, but oh so good. Afterwards, we checked out the Afterdeck Bar for the music being played. During the summer every Friday evening, you can view great fireworks displays over the water. Free Internet Wi-Fi is available at Louie's. Food is served in the sports bar until 10:30 pm. We would like to thank Louie's Backyard staff for assisting with our feature. Located just over the Port Isabella Causeway on the island. Turn left at Padre Blvd. Turn left on W. Marlin St., then turn right at Laguna Blvd. Update: Following Hurricane Dolly, Louie's backyard is now re-open and welcoming all! 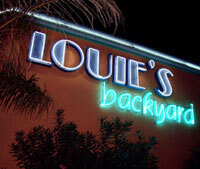 Louie's Backyard is a true entertainment hub on South Padre Island going on for over 30 years. Nightly entertainment includes karaoke, music, and a live DJ. During Spring Break every year, it is THE place to be for out-of-towners as Louie's fills to capacity for national hip hop and other singing acts that entertain, plus the nightly Miss Hawaiian Tropic bikini contest. 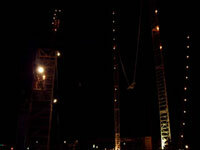 Just in front of the entrance to Louie's is nightly bungee jumping. After our huge meal, I couldn't coax Rhonda to try. For	the	adventure seeker,	it	is	the second tallest tower in North America. For more ground loving adventure seekers, they may want to try the drink dubbed the "hurricane on steroids" (aka, Charlie's Cherry). The Whammy signature drink was plenty enough for me.